Ooey, gooey, tart, and chewy. These sweet and salty power bites pack in some fiber and protein for an ultra satisfying treat. The balance of flavors and textures between rolled oats, dried cherries, pumpkin seeds, sunflower seeds, slivered almonds, honey, cinnamon and vanilla is a big hit for adults and kiddos alike. Rolled Oats: are a great source of fiber that supports healthy digestion and heart health. Dried Tart Cherries: are full of immune boosting phytochemicals - especially anthocyanins which give them their deep red color. 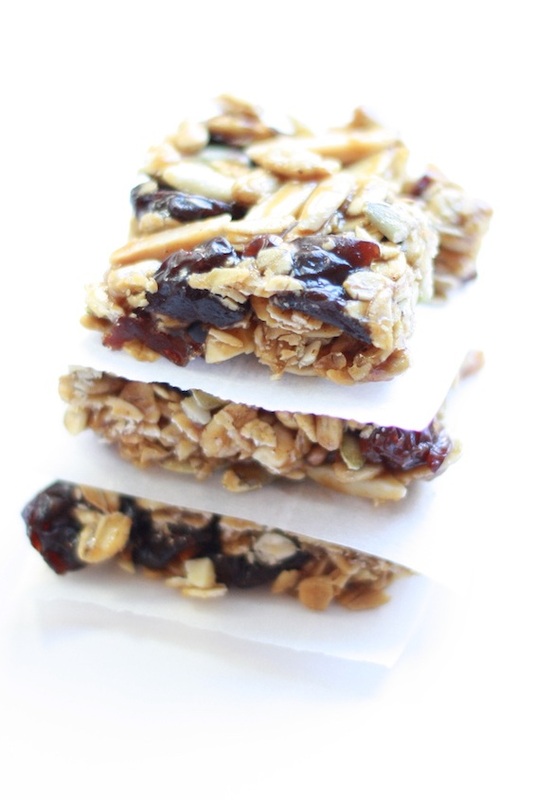 To avoid excess sugar, try using unsweetened dried tart cherries. Pumpkin Seeds: are a good source of many nutrients including zinc (an antioxidant) and magnesium (important for a variety of body functions impacting bone health, nervous system, muscle function, and sleep). Sunflower Seeds: a good source of many vitamins and minerals including vitamin E and zinc (powerful antioxidants) as well as B6 (supports metabolism and a variety of body functions) and magnesium. Almonds: among the many nutrients almonds provide, we especially like them for their anti-inflammatory and antioxidant properties. They are rich in vitamin E, calcium and magnesium. Flax Meal: a great source of omega-3 fats, fiber and unique phytochemicals. For maximum benefit, use flax meal or grind whole flax seeds (this makes it easier to digest and absorb the most nutrients) and store in a sealed container in the fridge. Packed with nuts, seeds and dried cherries, these granola bites make a great sweet snack or dessert. Line a square 8x8 pan with parchment paper. In a small saucepan, combine wet ingredients over medium-low heat, stirring constantly. Bring to a boil for 1 minute. Remove from heat but continue to stir for 1 minute, until mixture cools slightly. Add hot mixture to dry ingredients and stir until well combined. Spread evenly in prepared pan and press firmly to compact ingredients. Cool completely and then refrigerate for 2 hours. Once chilled, remove granola from pan and cut into 16 bites.